Investors are latching onto bitcoin as a new indicator for determining whether the stock market is headed for another downturn. A number of traders said they started paying closer attention to the highly volatile digital currency after it suffered a sharp fall about a month before the global stock market decline. The price of a bitcoin roughly halved from its late-December high of near $20,000, reversing a powerful speculative rally. That was followed by the first 10% decline in the S&P 500 in two years, beginning in late January. Recently, both have been volatile. Some investors say the tandem moves suggest bitcoin may be a barometer of investor sentiment that ultimately feeds into the stock market and other risky investments. If stocks are headed for another pullback, the thinking goes, bitcoin may fall first—and harder. 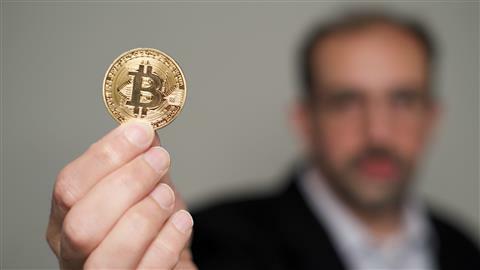 “We’ve begun to watch bitcoin more closely as a sign of speculative enthusiasm,” said Doug Ramsey, chief investment officer of the Minneapolis money manager Leuthold Group. The top in bitcoin in December and stocks in January marked a peak in investor optimism, Mr. Ramsey said. Tom Forester, chief investment officer at Forester Capital Management, said he pays particular attention to the big moves in the cryptocurrency when looking for signals. “We do view bitcoin as a sentiment indicator,” he said. In recent days, stocks and bitcoin have both been volatile, but for different reasons. Equities fell as the U.S. discussed and signed tariffs on steel and aluminum, then rebounded after a strong jobs report on Friday. Bitcoin prices dropped below $10,000 apiece recently as regulators globally scrutinized cryptocurrencies. Still, the relationship has been most closely aligned when investor sentiment is driving financial markets. Last month as the stock market sold off, the correlation between the cryptocurrency and the S&P 500 jumped to its highest in records going back to the beginning of 2016, according DataTrek Research, which looked at that link on a 90-day basis. Shorter-term correlations spiked as well, the firm found. For some investors, bitcoin is fulfilling a role that other highly volatile investments have played during previous market run-ups when frothy levels had become a concern: The highest-returning asset is often among the first to fall when investor appetite for risk starts to change. During the 1990s dot-com boom, for example, some of the most speculative companies with little or no profit history, from e-commerce retailer Pets.com Inc. to online grocery business Webvan Group Inc., shot to prominence the fastest. They were also among the hardest to fall, signaling a broader market retreat when the S&P 500 dropped 49% from its peak in 2000 to its trough in the fall of 2002. With the U.S. stock market bull run reaching its nine-year anniversary on Friday, investors are worried that the Federal Reserve is starting to pull back its extraordinary easing measure at a time when valuations are becoming stretched and the long U.S. economic expansion appears to be in its later stages. The proposed steel and aluminum tariffs have ignited concerns of a trade war. All this has traders looking for fresh signs that investor sentiment is turning again. Since many of the more speculative assets have been rising alongside stocks, any investor retreat from risk could have broad ramifications in markets ranging from metals and oil to emerging-market bonds. Few rallies have approached the size of bitcoin’s, where prices ran up from less than $1,000 at the beginning of 2017 to about 20 times that level in under 12 months. That drew in mainstream investor interest and spawned a series of other digital currencies. In one sign of crypto fever, an ice tea company rebranded to focus on the technology used in bitcoin. The S&P 500’s forward price-to-earnings ratio, a traditional valuation measure, topped out on the same December day that the bitcoin price peaked, according to Morgan Stanley .That was shortly before Congress passed a sweeping tax code overhaul, and the two gauges acted as a sign of “peak excitement” in the market, the bank’s analysts concluded. Many analysts say there are limits to the link between bitcoin and stocks. Nicholas Colas, co-founder of DataTrek, found that the high correlations began to drop after the market selloff ebbed in the middle of last month. Mr. Colas concluded that while there are signs the correlations between the two assets have been rising in recent months, the link is strongest when the assets are falling. Others outright reject bitcoin’s value as a stock market indicator. “I think that’s absurd,” said Jason Ware, chief investment officer at Albion Financial Group. “Ultimately, stock returns are grounded in the economy, corporate earnings, interest rates and inflation,” which he said that bitcoin investors don’t seem to care much about. Movements in the two assets have some very different characteristics. The levels of the S&P 500 and bitcoin have moved in the same direction on just over half of weekday trading sessions since the end of October, according to The Wall Street Journal’s Market Data Group. That is hardly a lockstep relationship. But even those who aren’t convinced bitcoin will signal the next big fall in stock prices say they are watching the cryptocurrency alongside other sentiment gauges. “I feel that there is always something at a top that offers a clue,” said Bruce Bittles, chief investment strategist at Baird. The US Secretary of State, Rex Tillerson, says Nigeria remains America’s second largest trading partner with trade volume in the region of $9 billion. Tillerson, speaking on his final leg of his African tour at the Presidential Villa, Abuja, after meeting with President Muhammadu Buhari, noted that Nigeria was regarded as America’s important trade partner. Nigeria is expected to play leading role as African countries sign Intercontinental Free trade agreement in Rwanda next week, Tillerson said. He noted that although the United States was not against taking loans from China, America is more concerned with the aftermath of the Loans as experience has shown that such countries ended up forfeiting their sovereignty. “You have to be in charge of your local infrastructures. We have seen a situation were some countries lost such control due to the loans,” he said. He revealed that Donald Trump has set up a committee to look at structuring financial strategy similar to what the Chinese government is offering with less risks. The US government is also developing mechanism that will also create alternative opportunities financing offer. There are alternatives, including great potentials for public private collaborations. He noted that the United States will want to see China obey international rules and norms and financial structure to deal with unforeseen circumstances, adding that countries need to look more carefully. “There are other alternatives ,financing mechanism that are available and I think in particular, of government plans to create the right conditions around those infrastructures investments, there are also great potentials for public-private sector co-investing in the infrastructures,” Tillerson said. Speaking on the abducted Dapchi school girls, he expressed hopes that the girls would be released peacefully through safe negotiation. He assured that the United States government has offered to assist Nigeria in ensuring speedy rescue of the girls by providing materials, intelligence training, among others. He affirmed that Boko Haram remains a threat not just to Nigeria but the sub region. Tillerson commended President Buhari for leading the sub-region in the fight against terrorism as well as his fight against corruption, which he noted had earned the president recognition at the African Union. “I think it is important to clarify that we do not seek to stop Chinese investments from flowing to countries that need those investments. But what we are cautioning countries is to look carefully, that the implications of the level of debts, the terms of the debts, and whether the arrangements around the local financing are intact creating jobs, local capacity or the projects being carried out by foreign labour being brought to your country,” he said. LONDON, March 13 (Reuters) - South Africa’s central bank expects a hike in value added tax (VAT) to lift inflation by around 0.6 percentage points over the coming year though it doesn’t expect to raise interest rates in response, one of its top policymakers said on Tuesday. South Africa announced plans to raise VAT for the first time in 25 years last month in its first budget under new President Cyril Ramaphosa. It is part of efforts to stabilise the country’s debt and repair its economy after nine years of mismanagement under the scandal-plagued, former President Jacob Zuma. “With inflation targeting, you try and look through exogenous shocks, particularly temporary ones and this is a one off,” Brian Kahn told Reuters on the sidelines of investor meetings in London. Latest data showed that headline consumer inflation slowed to 4.4 percent year-on-year in January from 4.7 percent in December. On a month-on-month basis, inflation eased to 0.3 percent in January from 0.5 percent in December. The move to raise VAT to 15 percent from 14 starting in April is expected to generate an additional 23 billion rand of revenue in 2018/19, but is also a politically risky step ahead of elections next year. South Africa’s powerful trade union movement and consumer groups have been vocal critics of the increase and are demanding an interest rate cut to ease the pain. Kahn said policy makers at the bank would not be“too concerned” about the tax hike pushing up inflation by 0.6 percentage points, with those first round effects filtering out of the data after a year. CAPE TOWN, March 13 (Reuters) - Refinery overhaul projects will begin in Nigeria as soon as the second quarter, an official from state oil company NNPC said on Tuesday. “We believe that by the second quarter of this year we will ...start getting the ball rolling on the refurbishment and rehabilitation exercise and believe this will run to the end of next year,” said Anibor O. Kragha, NNPC’s chief operating officer of refineries and petrochemicals. “We are working with consortia right now, negotiating terms, trying to finalise the time sheets so that we can access the money... through the end of 2019 when we believe we will have the minimum 90 percent capacity utilization in place,” he told delegates at the African Refiners Association conference in Cape Town. NNPC has three oil refineries with a total capacity of 445,000 barrels per day (bpd), but they struggle to run anywhere near that level due to years of neglect. According to NNPC reports, the highest capacity utilization last year was just under 37 percent, and it fell as low as 5.92 percent in November. 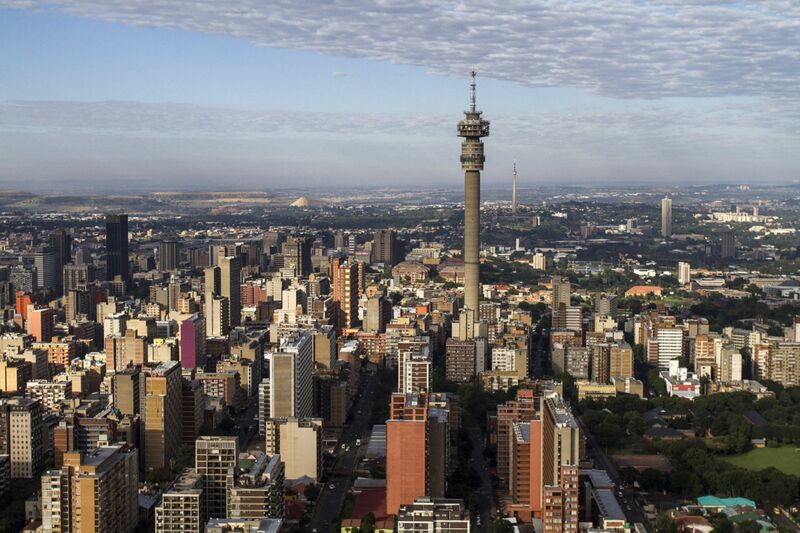 The city skyline in Johannesburg. South Africa plans to tap international markets for as much as $3 billion as the country seeks to take advantage of relatively low rates and strong demand from yield-hungry investors. South Africa budgeted to raise $3 billion in international markets in the next fiscal year. Though the funding period only starts on April 1, the country has pre-funded in the past. African sovereigns including Kenya, Nigeria and Senegal have sold $10.7 billion of Eurobonds in 2018, already more than half the record $18 billion they managed last year and exceeding the total for the whole of 2016, with record demand from investors. South African assets have outperformed emerging markets overall since late last year, as Cyril Ramaphosa, then deputy president and a former businessman and lawyer, maneuvered to succeed Jacob Zuma as president. The rand has strengthened 22 percent against the dollar since mid-November, the most globally, as the government moved to rein in the budget deficit, cut debt and stimulate growth. South Africa’s foreign debt is less than 10 percent of total borrowing. 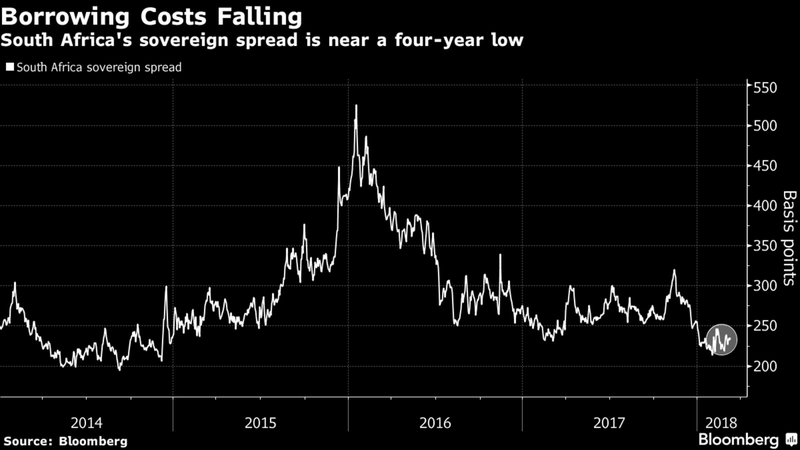 The country’s dollar spread over U.S. Treasuries is 237 basis points, down from as high as 320 in mid-November and compared with 311 for similarly rated Turkey, according to JPMorgan Chase & Co. indexes. The average for emerging-market countries is 312. South Africa last sold Eurobonds in September, when it issued $2.5 billion of notes maturing in 2027 and 2047 in September. Yields on the 2027 securities climbed two basis points on Tuesday to 5.04 percent. Power generation companies are planning to disrupt the supply of electricity across the country, an intention that suggests blackmail against the Federal Government, the Minister of Power, Works and Housing, Babatunde Fashola, has alleged. Last week, The PUNCH reported that some Gencos had dragged the government before the Federal High Court in Abuja over what they termed discriminatory practices against their interests and those of gas suppliers. The firms also accused the Federal Government of conferring preferential treatment on Azura Power West Africa Limited and Accugas Limited at their own expense. But speaking at the 25th Monthly Power Sector Meeting in Uyo, Fashola said the Gencos must be ready to explain to power consumers that despite all they had benefitted from the Federal Government, they were still planning to hold the citizens hostage. He stated, “Let me say very clearly to all operators that I get reports of many of the clandestine meetings that some of them (Gencos) are holding with a view to disrupting the supply for political capital. I will implore those that are truly ready to run the business they have acquired voluntarily to continue to do so with the assurance of government support and partnership. Fashola added, “I say this because you may not have noticed that Nigerians are increasingly taking their destiny in their hands. This is the essence of privatisation. If you bother to look up and around you, you will see solar panels on rooftops. The mini grid regulations allow them to procure one megawatt without a licence. The minister stated that the Gencos must be ready to face the court of public opinion, which according to him, is a court of conscience and morality. He noted that in the court of public opinion, the Gencos must be ready to tell the citizens how they felt when other groups went to court to stop the implementation of tariffs approved by Nigerian Electricity Regulatory Commission in 2016. Fashola said the power firms must explain to the public court whether they went to court before the government approved a N701bn payment assurance guarantee to pay their monthly bills. He added, “They must disclose to this court that they owed debts from the pre-Buhari era, because their income had reduced to less than 50 per cent. They must disclose to this court that they now receive about 80 per cent income and that this government is now paying them revenues collected from international customers from the Republics of Benin, Niger and Togo in dollars, as against the naira payment they used to receive. One of the largest gem-quality diamonds ever mined has sold for $40 million. A 910-carat diamond, named "The Lesotho Legend," was bought by tender Monday by an unnamed buyer in Antwerp, Belgium, according to Gem Diamonds. Gem Diamonds, which retrieved the rock in January, said it was the fifth-largest gem-quality diamond ever recovered. The firm said it had removed the diamond from the Letseng mine in Lesotho, a country encircled by South Africa. According to Gem Diamonds in January, it was the largest diamond to have been recovered from the mine. The company owns 70 percent of the Letseng mine — a location renowned for its production of white diamonds. Following the sale, Gem Diamonds CEO Clifford Elphick said in a statement that the company was "delighted," adding that its purchase highlighted the "exceptional quality of The Lesotho Legend itself" and the high standard of the Letseng mine's diamond production. Gem Diamonds has recovered a number of diamonds in recent months, with the company stating last week that it had unearthed six diamonds larger than 100 carats since the start of the year. EVENTS KENYA AND UGANDA - The statistics offices in both countries are due to release February consumer price index data. MAURITIUS - The central bank is expected to announce its benchmark repo rate decision. GLOBAL MARKETS Asian shares extended losses on Wednesday and bonds were sold off as weak factory data from China revived worries about global economic growth amid fears of faster rate rises in the United States. WORLD OIL PRICES Oil prices fell for a second day on Wednesday as weak Chinese factory data triggered concerns of an economic slowdown that could lower oil demand and, in the United States, industry data showed an increase in crude stockpiles amid its soaring output. EMERGING MARKETS For the top emerging markets news, double click on AFRICA STOCKS For the latest news on African stocks, click on SOUTH AFRICA MARKETS South Africa's rand weakened more than one percent on Tuesday as investors took profit from a recent rally that sent the currency to new three-year highs overnight when new President Cyril Ramaphosa changed the finance minister in a cabinet reshuffle. KENYA MARKETS The Kenyan shilling strengthened against the dollar on Tuesday, lifted by healthy hard currency inflows from horticulture exports and remittances, traders said. KENYA RETAIL Africa's biggest supermarket chain, Shoprite Holdings , will take advantage of disarray in Kenya's grocery sector to open its first stores in the major East African market by the end of this year. GHANA Ghana will certify the value of gold exports as part of efforts to tighten controls on the sector to ensure the state receives the revenues it is due, the vice president said on Tuesday. NIGERIA ECONOMY Nigeria returned to growth in 2017 after suffering its first recession in a generation the previous year, data released from the country's statistics office showed on Tuesday. NIGERIA CRUDE Nigeria's state oil firm NNPC is in the final stages of talks with two consortiums that include top traders, energy majors and oil services companies to revamp its dilapidated refineries, sources familiar with the matter said. ZIMBABWE MINING Zimbabwe expects to earn $1.78 billion from mineral sales in 2018, up from $1.5 billion last year, Masimba Chandavengerwa, chief executive of the government marketing agency, told a mining conference on Tuesday. Nigeria sold $2.5 billion of Eurobonds on Thursday as it sought to lower funding costs by using the notes to refinance higher-yielding naira debt. Africa’s biggest economy sold $1.25 billion of 12-year securities at 7.143 percent and a separate 20-year tranche, also $1.25 billion, at 7.696 percent, the Finance Ministry said on its Twitter account. The nation’s fifth Eurobond sale received subscriptions in excess of $11.5 billion, according to the ministry. Proceeds will be used for “refinancing of domestic debt,” the ministry said in a series of tweets. The sale completes a dollar-debt program of selling more foreign debt to help reduce the burden of paying double-digit yields on local-currency bonds. That would free up funds needed to expand infrastructure, and help the economy sustain recovery from a contraction in 2016, the first in a quarter-century. Nigeria sold a record $4.8 billion of Eurobonds last year, most recently in November, when it issued $3 billion of 10- and 30-year debt. Yields on the latter rose seven basis points to 7.71 percent by 5:32 p.m. in Lagos, the highest since they were issued. Nigeria’s local bonds have an average yield of 13.8 percent, according to data compiled by Bloomberg. Citigroup Inc. and Standard Chartered Plc managed the deal, while Standard BankGroup Ltd.’s Nigerian unit was a financial adviser. Nigeria follows Egypt, which became the first African sovereign to tap the market this year when it sold $4 billion of debt on Feb. 13. Angola, Ghana, Ivory Coast and Kenya have all said they are considering deals soon.